If you have no plans to sell your business, an up-to-date valuation may seem like an unnecessary expense. But you might be surprised at how important the current value of your business can be to achieving your long-term goals. The current value of your business can affect how you approach everything from retirement to estate conservation and your succession strategy. The typical business owner has 50% to 70% of his or her net worth in the business.1 If you expect your business to help fund your retirement, a significant change in value might mean you need to adjust the amount of income you are investing for retirement. A shift in value might also affect the date at which you expect to retire, which could influence the timing of your decisions about the kinds of preparations you expect to make to get the business ready to sell or pass on. It’s understandable if you would rather not spend too much time thinking about whether your business has lost value, but there could be an upside to knowing. If you are expecting to transfer ownership to the next generation, lower asset values may help you transfer a larger share of the business without tax consequences. If your business has a buy-sell agreement that values the business too highly, a more reasonable valuation may help the survivors or successors take over without paying more than the business is actually worth. If you discover that your business is responsible for more of your net worth than you realized, it could indicate that it’s time to diversify away from the business. It’s rarely a wise move to let your financial future hinge on the fate of a single asset — even if it is your own business. Given the events of the past few years, you may be more inclined to focus on today’s problems than on what could happen years from now. But a precise valuation may provide you with valuable information that you didn’t realize you needed. Sarah Tolson is a registered representative of and offers securities, investment advisory, and financial planning services through MML Investors Services, Inc. Member SIPC. (2121 N. California Blvd. #395, Walnut Creek, CA 94596 (925) 979-2300). CA Insurance License #OF43069. Today’s guest blogger is Sarah Tolson, a Certified Financial Planner with her office in Danville. Her bio and contact information are below. Christina’s note: this is a really important issue, because we need to prepare for retirement and our elder years in ALL ways, and not just with our estate plan. Planning financially is critical, especially these days where we are living longer and longer, so we need more resources for a longer time. Inflation is defined as the long-term, sustained rise in the general price level of goods and services. The most popular measure of inflation is the Consumer Price Index. The CPI attempts to measure the rate of inflation experienced by the average American, but this figure may not be entirely applicable to your situation. For example, depending on your lifestyle and where you live, your costs for housing, food, and medical care may vary significantly from the national averages. 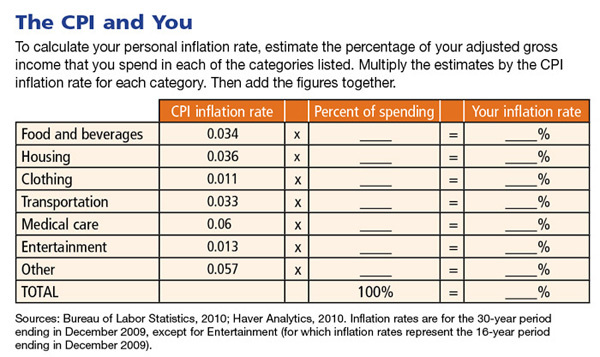 Because the CPI may have only limited usefulness when trying to measure how inflation affects your personal finances, the accompanying worksheet can help estimate your personal inflation rate. This information may help you better understand how inflation could affect your financial future, especially retirement. The information in this article is not intended as tax or legal advice, and it may not be relied on for the purpose of avoiding any federal tax penalties. You are encouraged to seek tax or legal advice from an independent professional advisor. The content is derived from sources believed to be accurate. Neither the information presented nor any opinion expressed constitutes a solicitation for the purchase or sale of any security. This material was written and prepared by Emerald. © 2010 Emerald.